Term Four- How did we live in the Stone Age? In term 4 we are going to be learning all about Stone Age Britain. Over the half term break please make sure your complete your topic homework on the Stone Age- Bronze Age. Research what Stone Ago people used to find food and shelter to help you understand more about them. Can you discover anything else about our topic? Have you read other stories by this author? What do you think of the illustrations this author/illustrator creates? Can you find any other Satoshi's other books in your local library? 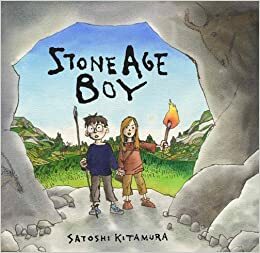 We will be focusing on the character in the story and his journey back in time to the Stone Age. We will be revising addition and subtraction of 3 digit numbers using more formal methods. Use this game to help you practice quick subtraction! We will then be revising time, reading analogue and digital clocks and calculating time intervals. You can practice this easily at home with family and friends. Why not pick up train/ bus/ tv timetables to calculate how long you have to wait. Towards the end of term we will be revising our times tables! Make sure you are confident in your 3, 4, 6, 8 and 9 times tables! Remember double your 4 to find the 8, double the 3 to find the 6... and triple the 3 to find the 9- or use your fingers!